PARIS—As is the case most Sundays, Rue de Bac in central Paris was quiet this morning. The shops were closed, as were most cafes on this day when self-styled centrist Emmanuel Macron would defeat the far-right candidate, Marine Le Pen, to become France’s next president. Except for Le Saint Germain cafe, at the corner of Rue du Bac and Boulevard Saint-Germain. On the outdoor terrace, patrons sipped on coffee and munched leisurely on croissants, as is the custom on any morning. Most were reading a newspaper. Two American tourists thumbed through a Lonely Planet guidebook; true to form, their voices a decibel level or two above the rest. Inside, 58-year-old Marco was working behind the bar. Gray-haired with the sleeves of his white button-down shirt rolled up and a black apron tied around his soft waist, Marco served coffee and croissants to customers standing at the bar. “Have you voted yet?” Marco asked an older man who wore a driving cap and was reading a copy of Le Figaro, a staple conservative French newspaper. Outside the cafe, the sky was gray, the air cool and fresh, and the sidewalks still wet from spring showers the evening prior. 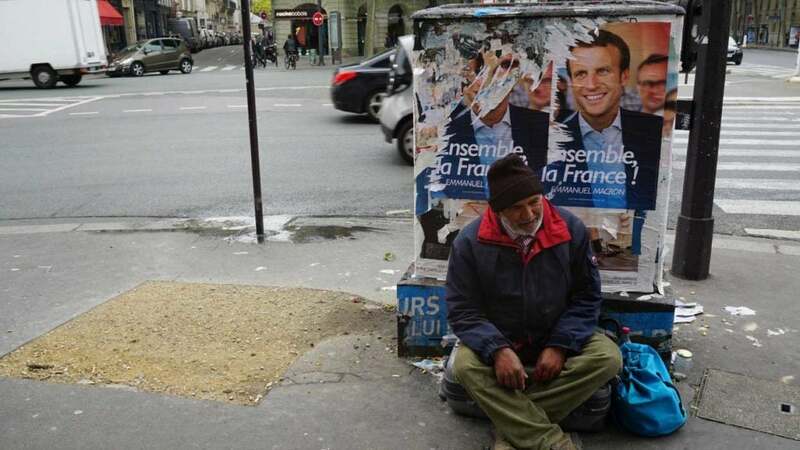 A homeless man sat beneath two vandalized campaign posters for Macron, France’s 39-year-old former economy minister under Socialist President François Hollande. Macron ended up winning Sunday’s presidential election by taking 65 percent of the vote to defeat his rival, Le Pen, 48, of the far-right, eurosceptic, anti-immigration National Front party. “His resounding victory confirms that a very large majority of our fellow citizens have united around the values of the Republic and signaled their attachment to the European Union as well as the opening up of France to the world,” incumbent French President Francois Hollande said of Macron’s victory in a Sunday evening statement. Yet, with his win, Macron faces a divided country with a litany of economic and security woes, including terrorism and high unemployment. “Many will be breathing a sigh of relief with Macron’s win but while he is far more preferable than the anti-NATO, anti-American, and pro-Putin Le Pen, we should not kid ourselves into thinking that he represents the sort of change France so desperately needs,” Luke Coffey, director of the Douglas and Sarah Allison Center for Foreign Policy at The Heritage Foundation, told The Daily Signal. “While Le Pen would have done great damage to France and its standing in the world, Macron’s stale economic policies mean that France will remain on economic life support for the foreseeable future,” Coffey said. Sunday marked the tepid end of a historic French presidential campaign. 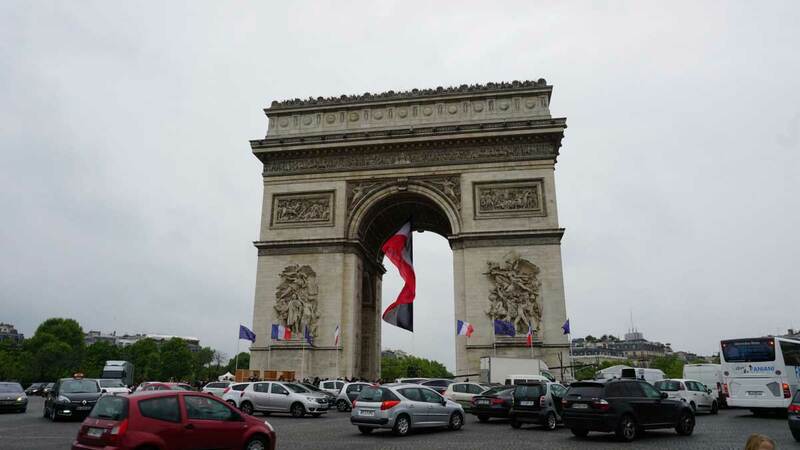 For the first time in France’s Fifth Republic, the Socialists and Les Republicains, France’s establishment liberal and conservative political parties, respectively, were not represented in the second, final round of the presidential election. 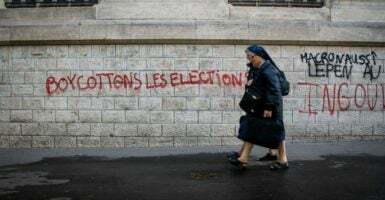 Sunday’s vote highlighted an upheaval of France’s political order and a stark crossroads for France’s future due to the diametrically opposing political policies and philosophies of Macron and Le Pen. However, for many French voters, both Macron and Le Pen were a disappointment. Le Pen was too extreme, and Macron was considered to be under the thumb of France’s banking elite. 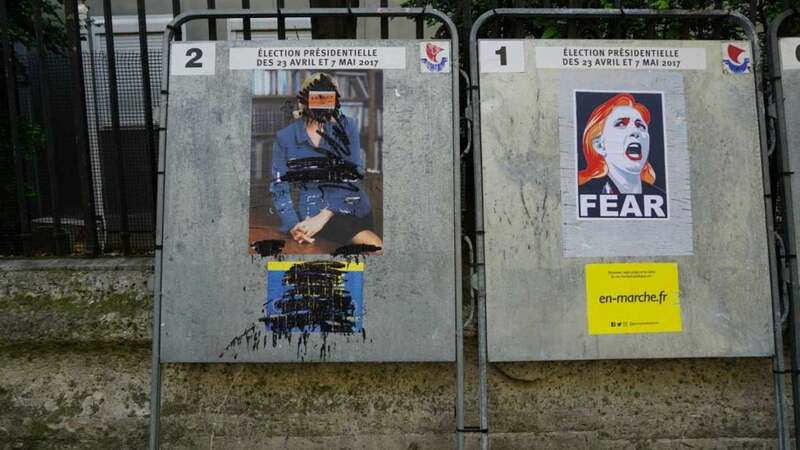 “My favorite candidate was François Fillon,” Carmen Van Houten, a 52-year-old pediatric nurse at a public hospital told The Daily Signal, referring to the conservative Les Republicains candidate who lost in the April 23 first round of voting after a scandal-tainted campaign. By all accounts, the lack of enthusiasm generated by both candidates translated into historically low levels of voter participation. 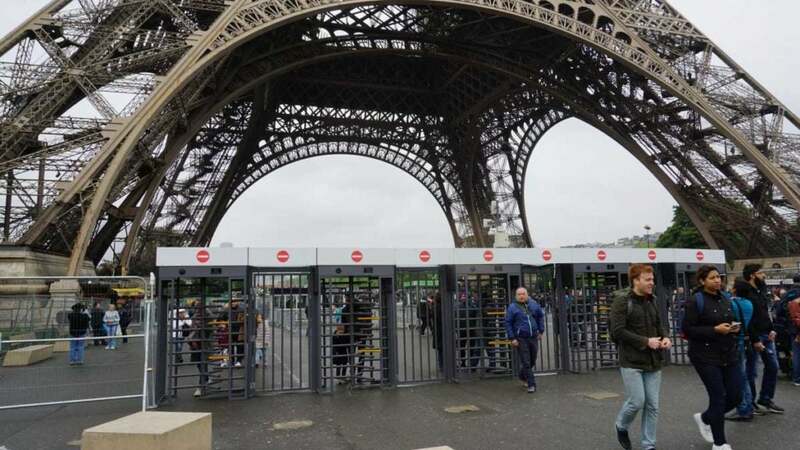 As of 8 p.m. in Paris, turnout was estimated to be roughly 75 percent—the lowest level of voter participation in a presidential second-round vote since 1969, according to French news reports. “Divisions remain, but Emmanuel [Macron] will now have to address the most important concerns,” Nicolas Tenzer, founder and president of the Centre for Study and Research for Political Decision, a Paris-based think tank, told The Daily Signal. Macron represented his own upstart political party, En Marche!–translating to “Let’s go!” or “forward!” in English–which he formed in April 2016 as a vessel for his maverick presidential campaign. He does not have the backing of a major political party in France’s National Assembly, which could make it hard for him to pass his agenda. Macron’s victory was, however, a landmark defeat for far-right, anti-immigration, anti-EU parties across Europe—as well as for the Kremlin’s machinations to fund and support those parties to weaken its perceived Western rivals. “This was the best of a bad situation, but at least the only person more disappointed than Le Pen right now is Russian President Vladimir Putin,” Coffey said. The National Front, the party of Le Pen, is a controversial political force in France. Its founder, Jean-Marie Le Pen (Marine Le Pen’s estranged father), was notorious for his Nazi-sympathizing, anti-Semitic remarks—including his calling the Nazi gas chambers of the Holocaust a “detail” of history. Yet, many French voters—35 percent of them—were willing to overlook the National Front’s checkered past and dubious ties to Moscow to upend France’s political and economic status quo. In Paris on Sunday, tourists passed through airport-style security barriers to approach the foot of the Eiffel Tower. Armed army fire teams, clad in body armor and with assault rifles slung across their chests, patrolled among the crowds. News teams from around the world were set up with the Eiffel Tower in the background as reporters rehearsed their stand-ups for election day reports. Up the river at the Musée d’Orsay art museum, which contains works by Vincent van Gogh, Claude Monet, and Paul Cézanne, people waited for hours in a line that zigzagged around the block before it trickled through metal detectors and X-ray machines at the museum’s entrance. 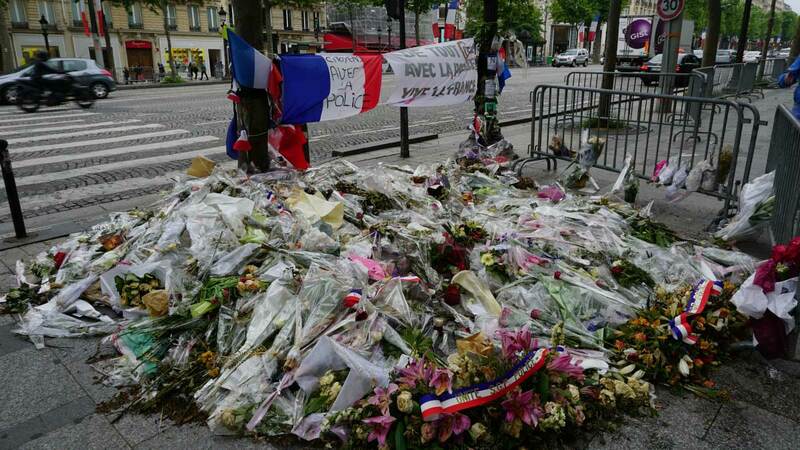 This was a bellwether day for French democracy, and the fears of a terrorist attack were high. 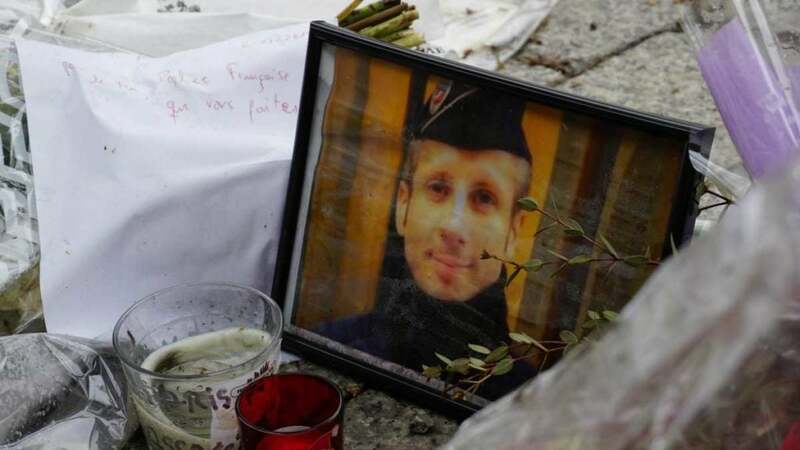 On the Avenue des Champs-Élysées, a makeshift memorial stands at the spot where, on April 20, an Islamist militant killed French police officer Xavier Jugelé. Within a mound of collected flowers are handwritten notes, candles, and pictures of Jugelé. The memorial is remindful of the ones that went up on the Promenade des Anglais boardwalk in Nice after a deadly terrorist attack in July 2016, or in front of the Bataclan nightclub in Paris after a terrorist attack, which left 89 dead, in November 2015, or in front of the Paris offices of the French satirical magazine in January 2015 after another lethal terrorist attack. On this day, election day, the sidewalks of the Champs-Élysées were packed almost shoulder-to-shoulder with pedestrians. At the memorial at the site of Jugelé’s murder, a small group of passers-by paused to silently and reverently consider what had happened here a little more than two weeks ago. 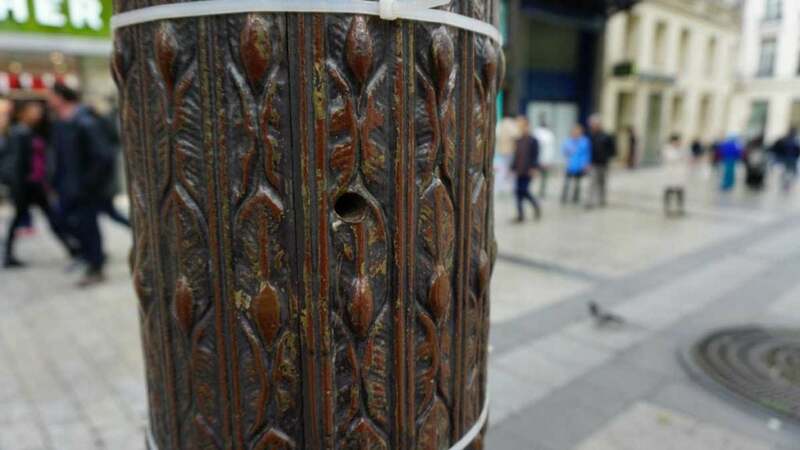 Meanwhile, as unaware tourists marched past, a bullet hole remained in a nearby light pole. It reminded this correspondent of the top of Institutskaya Street in central Kyiv, Ukraine (now renamed Heroes of the Heavenly Hundred Street) where bullet holes remain in light poles from the 2014 revolution, evidence of when government snipers gunned down protesters in the waning days of deposed pro-Russian President Viktor Yanukovych’s regime. Scars of violence on the streets of Kyiv and Paris—reminders, in both places, of the thin veneer that separates civilization from chaos. A dividing line, which is growing thinner in capitals across Europe.